Packing to go on vacation HERE. Quisisana Resort in Maine. Today's post is being brought to you by Angry Birds Rio, which Beatrix is playing (with the volume at full blast, it sounds like a jungle in here) on my iPhone. She'll get frustrated in about 2 minutes and will go back to her watercolor set, which I greatly prefer because it is quieter and not a "screen." For now, monkeys and birds for her while mommy writes with a little help from Starbucks Breakfast Blend. No one is paying me to advertise, folks, I just like details so you can have a good picture of what is happening here. I read over yesterday's post and was a bit disappointed with the quality. Not that I am going for a grade or anything, but I think I was writing too late and trying to write too much. Today I am starting earlier and will stop when I lose my mojo because I like quality over quantity here at My Own Space. I am also packing up for a summer out of town, so I have a lot of pots bubbling at the same time (better metaphor than yesterday). So we left off with Rob and Charlotte (who has morphed from mini Dr. Ruth to mini Dr. Phil) talking about babies and life choices. I'd interrupted myself to do a "no baby justification" time line and I was about halfway through, on my way back to the living room conversation and how that brought us to where we are today (2 kids, no dog, you remember). 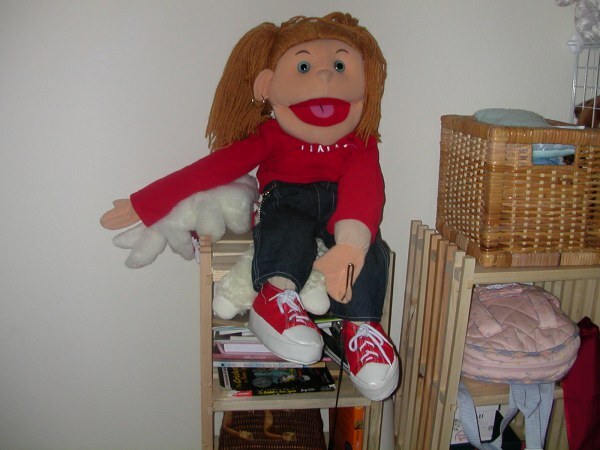 The "rod" puppet I bought online the night I saw AVENUE Q on Broadway. I practiced puppeteering instead of having a baby. 2004: Rob and I work hard at various jobs that come and go, but watch as our savings evaporates and our health benefits end (so we are not uninsured, we buy them privately at a huge cost). In February of 2004 I see Avenue Q on Broadway and fall in love with the show. It was good timing, because I was going through a period of feeling like maybe I wasn't meant to be an actress anymore--nothing was exciting me and the business was feeling hard, hard, hard. After seeing Avenue Q, convinced I should play Kate Monster, I buy a "rod" puppet online to "train." I make it talk to Charlotte constantly, which (happily) is very fun if you are in Kindergarten and not nearly as creepy or stalker-mom-ish as it sounds. Charlotte, because she's Charlotte, does not just laugh and be entertained, but takes my quest to be a puppeteer seriously and critiques my voices and puppeteering. I tell my agent I’d like an appointment for the Avenue Q. She tells me she won’t even make a phone call because they are only looking for professional puppeteers. The puppet fires my agent. In the fall of 2004, Rob goes to North Carolina to do an out-of-town workshop production of Little Women the Musical with Sutton Foster (side bar--go see her in Anything Goes, she just won the TONY a few days ago). While he was gone I had a "pregnancy scare" and later, when I called to tell Rob I wasn't pregnant, he was thrilled (because he was worried about money, and health benefits). I acted all like, "Whew! Thank god, huh??" And later cried--which surprised me. I go out of town for work (Seattle and Portland), just as Rob comes home from North Carolina. Charlotte embraces the word "gypsy" and misses days of school. She has a frequent flier account. Shameless self promotion of my book, which is available for purchase on Amazon. This really should count as my second baby. 2005: (January) I am miraculously, gleefully contracted to write 'Til the Fat Girl Sings have you read it? I am given 6 months to write it, and I write like mad, also doing some out of town work with symphonies to keep money coming in. Rob opens and closes Little Women on Broadway and we wring our hands a lot about future finances. For a month I sequester myself in New Hampshire to finish the book. Rob stays in New York with Charlotte. While I am in New Hampshire, I hear that they are casting the Las Vegas company of Avenue Q. Hot diggity! I drive back to New York, kiss Rob and Charlotte, go to the audition, and get the job. I ask for an extension on my book deadline. I am given another month to complete it. In that month, I finish the book, rehearse Avenue Q and move my family to Las Vegas. It was an awesome and exciting time. We buy a car instead of a crib, but I think (without saying it) that if we can make some money in Las Vegas and the show runs long enough, we might have a baby in the near future. A complication--I was the major earner at that time and getting pregnant would end income for a big chunk of time. For Charlotte's 8th birthday she asks to "adopt" a baby from FAO Schwartz's nursery. She names him Charles. 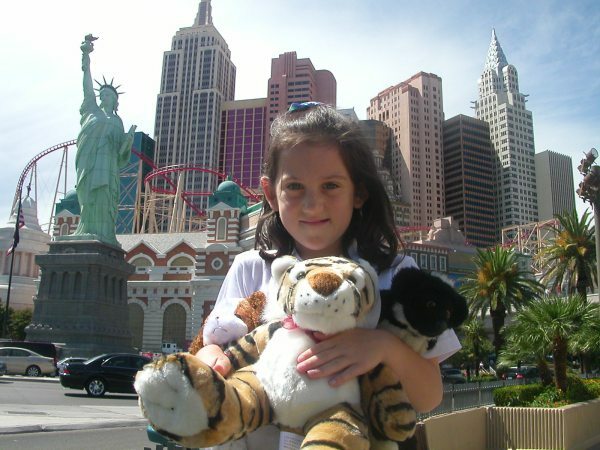 The native New Yorker poses in front of the phoney NYC skyline in Vegas, holding her loot from Circus Circus. We moved to Vegas instead of having another baby. Charlotte choosing a baby. Foreshadowing. 2006: We live in Henderson, Nevada. We have swimming pools, a great school, no rent (it’s paid for) 2 cars, friends and a great job. Rob hikes every mountain in a 3 state radius and loves being super-stay-at-home Daddy (although he gets a lot of work playing shows in Vegas, too.). I mention a baby, like, "Hey, wouldn't it be nuts to have a baby right now??" but then--Avenue Q, which has had a theater built just to house it at The Wynn Casino, announces a premature end. The show closes on May 31st and my book comes out June 1st. We move back to New York (ANOTHER 5th floor walk up, this time on 87th street), Rob goes on tour with Little Women the Musical for the summer, and I go out on a book tour. My biological clock ticks and tocks and rings and dings. Charlotte starts third grade. We are working our tails off to get regular work (oh-I get sooo close to a couple of big bway shows---heartbreaking), and Rob starts teaching as an adjuct professor at Pace University. Charlotte, sick as a dog on moving day. Up 5 flights of stairs and the mercury hits outside 97 while Charlotte's temp hits 103. Welcome back to New York. 2007: Rob, who has always had a passion for teaching, starts looking for a full time university position. By some kind of miracle, our friend Amy offers him a full time position at Pace starting in the fall as Professor of Music in the Musical Theater Department (a GREAT program). Rob is elated. I am publicizing my book, but not doing a lot of theater, turning down work to stay in town. Charlotte is finishing up 3rd grade, and Ripley is in her class. WHEW. We're caught up. I hope that was helpful. Also, as an added bonus, if you read my book, you basically just got the readers digest version of everything that has happened since the last part of my book, because it ends when I get cast in Cats. Rob: Was grilled this morning re: facts of life. Rob: You were right on all accounts. Let's talk when I get home. Three's company, four's a possibility. So later, after we'd put Charlotte to bed, we sat on the couch and talked seriously for the first time ever, about whether or not we were going to have another baby. We went through the pros and cons (no space, not enough money, makes life so much harder, we don't remember how to change diapers vs. the clearly stated case by Charlotte). Rob talked a little bit about the benefit package that would come with his Pace job, which was an incredible and foreign idea. Regular benefits. Steady paycheck. The deal wasn't signed, but it was looking decent. As the female-child bearer, I was hesitant. I would be 40 when I delivered the baby. I'd had a rough pregnancy with Charlotte, a miscarriage prior to having her, and that was 10 years ago. I think making the decision to get pregnant is very hard--and something you really can delay and delay. Who knew if it really was the right thing for Charlotte? She was a great kid. What if she resented the baby? Was it really wise to have a baby just because your 9-year-old wanted to? Did I REALLY want to be pregnant again? UGH. Morning sickness. I was exhausted just thinking about it. The decision was sealed when Rob made the following statement. "You know, it's not like we HATE babies." BABIES!!!! We love babies!! We decided I would make an appointment with my ob/gyn the next day to get checked out and we had....well.....my godmother is reading this, so let's just say we had a fun night. The next morning I woke up with cold feet--putting the idea of pregnancy on hold while I thought things through. A week later, I went to the doctor.